When you want to nosh, what kind of appetizer or snack would you have? Basic home snacks could be anything from crackers with a topping, veggies and dip, even cookies or a cupcake. If you're out at a restaurant, you might see on the menu: cheese sticks, nachos, tequitos, deep fried veggies, chicken fingers. Been there, done that, lets have something very different, romantic(hey, it's Italian), yummy and it's healthy (I know, I know, bad word, especially around kids, but not this snack!) It's Bruschetta, and while it might be a little difficult to pronounce the first time; you won't forget after you've had it. Bruschetta (Italian pronunciation: [brus-ket-a]; American pronunciation: [bu-shetta], ignoring the “c” altogether ) is an appetizer from central Italy whose origin seems to date back to the 15th century, but possibly even older than that. It was a way to use stale bread by toasting or grilling it, then enhancing the flavor by rubbing with garlic and topping with extra-virgin olive oil, salt and pepper. Variations may include toppings of spicy red pepper, tomato, vegetables, beans, cured meat, and/or cheese; the most popular recipe outside of Italy involves basil, fresh tomato, garlic and onion or mozzarella. 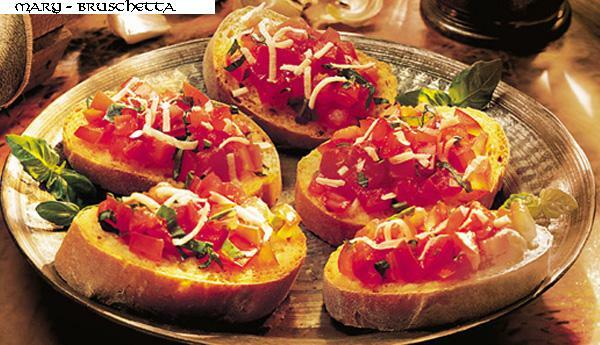 Brushchetta can be served as an appetizer, or simply enjoyed as a snack. Grill both sides of the sliced bread; or place under a broiler for 1 minute, flip slices, place under broiler for another minute. Cut the cloves of garlic in half and rub cut sides over one side of bread; drizzle olive oil, sprinkle on salt. Grill both sides of the sliced bread; or place under a broiler for 1 minute, flip slices, place under broiler for another minute. Smear one side of each slice with minced garlic. In a small bowl, mix together olive oil, tomatoes, salt, black pepper, basil and vinegar. Top garlic side of each slice of bread with mixture. 1 – Shaved parmesan cheese can be placed on top of mixture. 2 – Thin slices of mozzarella can be placed on top of mixture; place under broiler for a minute to allow cheese to melt. This recipe was published in Taste of Home Magazine, September 2007 issue. I had sent it to them way back in 1997, and then suddenly they contacted me in 2007 to say that they were going to publish it. Imagine my surprise! In a large skillet, saute shallots and garlic in 2 tablespoons oil until tender. 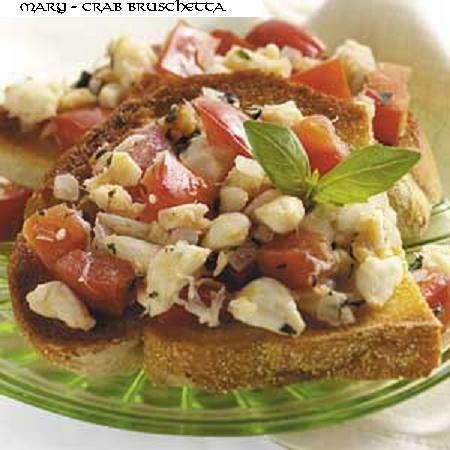 Add the crab, tomatoes, basil and oregano; cook and stir for 5-6 minutes or until heated through. Remove from the heat. Brush both sides of each slice of bread with remaining oil. In another large skillet, toast bread for 1-2 minutes on each side. Cut each slice in half; top with crab mixture.